Our Venetian Polished Plaster & Decorative Plaster Course teaches you how to achieve beautiful finishes using Venetian Plaster, Stuccolustro and Lime Wall Finish including the associated soaps, waxes, lustres and micas. Our approach is to create a relaxed environment to enjoy learning, with ample opportunity for discussion throughout the day. 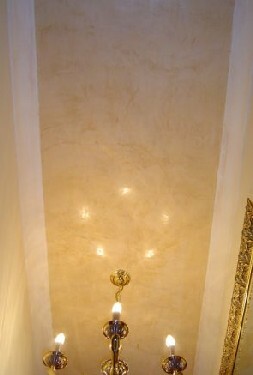 For each session there is a step-by-step demonstration by one of our experienced, specialist plasterers. You will have a number of boards to practice on - using a range of colours, finishing soaps, metallic pigments and flakes for crating unique polished plaster finishes. You can take your sample boards home at the end of the course. Our support does not end at once the course is finished. Contact our helpful Technical Sales Team for troubleshooting and guidance on your individual projects. We can also supply sample boards for colour matching particular schemes and ensuring colour selection is correct before committing to larger orders. You can purchase materials and tools on the day of the Venetian Polished Plaster Course. Participants are entitled to a future 10% discount on purchases from our range of associated tools and materials. For further information or to book, call our office during opening hours and make a payment by card. You can also make an enquiry online by selecting ‘ADD TO QUOTE' and pay by bank transfer.